Almost a year has passed since the Mifid II directive came into force. This year has been described as transitional as both investment banks and institutional investors digest and respond to the new regulation. The anecdotes began to pile up as the year progressed. Notably, we hear that conference attendance is down by around 20 percent-30 percent, and various prominent institutional investors have told us their research and corporate access budgets have been set anywhere from 20 percent to 60 percent below 2017 levels. Every year around this time, we begin to develop investor marketing programs for the upcoming year on behalf of our corporate clients. We always pay close attention to the conference calendar when thinking through marketing plans, both to look for opportunities for our clients to participate and to mark off dates to hold back on marketing. This year, we got sidetracked by curiosity and decided to see whether we could measure changing behavior on the part of the banks by comparing conferences announced thus far for 2019 with the 2018 conferences announced around the same time in 2017. It’s an imperfect exercise as it relies heavily on the accuracy and completeness of the data – special thanks to Virtua Research and FactSet – but our findings are noteworthy enough to publish. We share our observations below along with some informed guidance for IROs and the C-suite. The decision on whether to proceed with a conference needs to be made well in advance. If you have ever tried to find a suitable venue in New York that can accommodate 500+ people on short notice you know what we mean. The conference calendar is also very competitive, and the bank that sends out its ‘save the date’ early has first-mover advantage in the competition for investor commissions. An investor conference can cost anywhere from $200,000 to $2 mn, and the forward conference calendar may therefore be a good leading indicator of how banks will allocate resources in the future. Having provided a bit of background, let’s look at what the data shows and try to draw some conclusions. 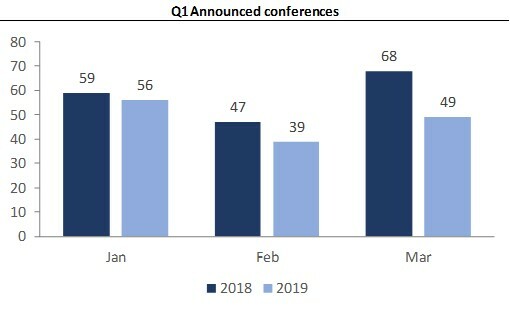 Thirty fewer conferences are being marketed for the first quarter of 2019 compared with the same period last year: that’s a 17 percent decline. We would caution you not to look past the first quarter of 2019 until the new year begins as a smaller portion of the conferences that occur in the back half of the year get marketed this far in advance. 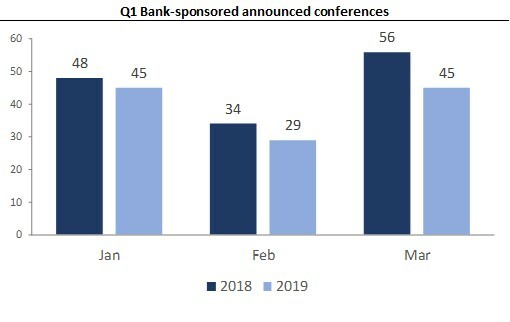 There are 19 fewer bank-sponsored conferences scheduled for Q1 2019 compared with Q1 2018. The second quarter looks to be a bit more consistent at this stage, but it’s too early to form a view. Check in with us for updates as we will be following this closely. Various institutional investors have told us they have cut their broker lists – in part to create economies of scale with those brokers that provide access to a broader swath of products. 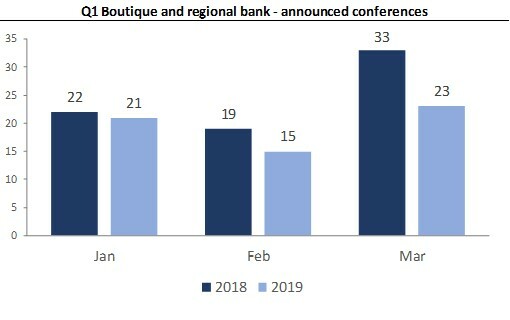 Yes, we are talking about the bulge-bracket banks, which have in turn said they will maintain their ‘flagship’ conferences despite observing attendance declines in the 20 percent-30 percent range. 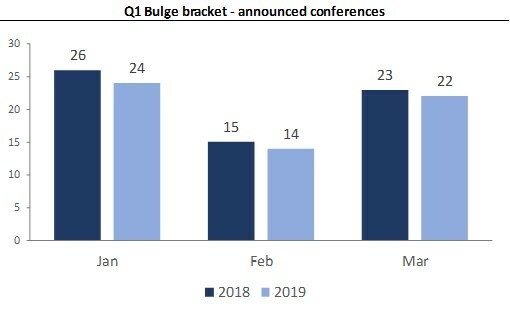 The number of announced bulge-bracket conferences for the first quarter is roughly flat compared with the prior year. We note that these commitments have likely been set in stone for quite some time. The third quarter looks a bit more tenuous and bears watching closely along with the fourth quarter. Several market commentators have forecast that smaller firms would suffer the most in a post-Mifid II world, and we may be starting to see the impact felt in the conference calendar. 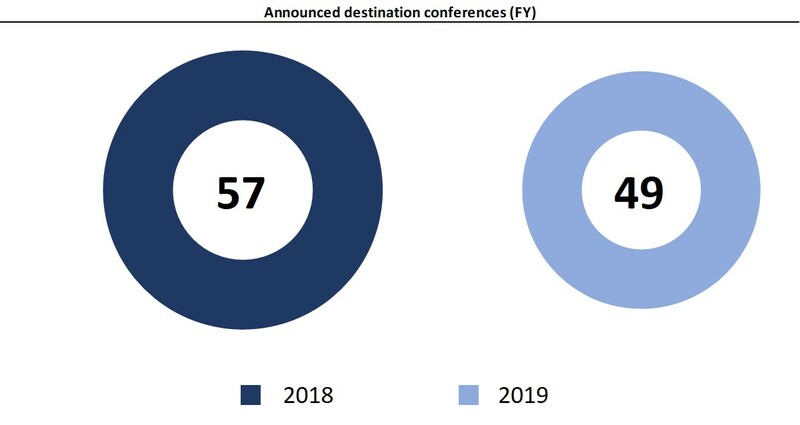 Also of note, destination conferences may be dying a slow death. These are often planned up to 18 months in advance and are only derailed due to a shock to the system (like Mifid II). Announced conferences in locales with climates more hospitable than ours in NYC are down 14 percent compared with the prior year. One change observed is almost definitely a result of Mifid II and too significant to be explained away. 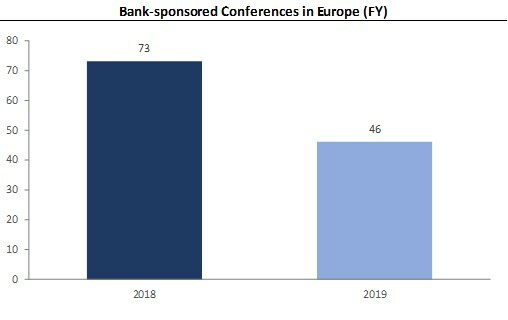 There is a (shockingly) large decline in announced conferences occurring in Europe, the region explicitly impacted by Mifid II. The number of announced conferences in Europe is down by 27, or 37 percent, compared with the prior year. This figure will surely put fear into any European IRO. After all, revenue opportunities drive investment banks’ budgets. Regardless of whether commissions continue to slide, a banking fee will always trump a regular-way trade, and a bank isn’t very likely to generate banking fees without showing commitment to a sector. If there are fewer fees to be earned in a particular sector, internal budgets will shift. Here’s the same chart showing gross proceeds from capital markets transactions by sector (right-hand axis) through mid-November 2018. The relationship is pretty clear: the fewer banking opportunities exist in a sector, the fewer resources will be allocated to that sector. This is particularly true for cyclical industries, and is more pronounced following Mifid II. So what does this all mean for the corporate? Several months after May Day in 1975, when brokerage commissions went from fixed to negotiated, Philip Loomis, then commissioner of the SEC, stated that the consequences were ‘still not entirely clear’. The May Day regulations ultimately gave rise to the full-service brokerage model and the proliferation of the equity research and corporate access products. Forty-three years later, regulation continues to affect the economic relationship between investment banks and institutional investors. The lasting impact on corporates is still not entirely clear, but short-term indicators look ominous. The research and corporate access landscape has certainly begun to change, and 2019 is likely be another transitional year where trends should be closely watched. Meetings between companies and investors are a long-standing part of the investment process. The importance of this has not changed, but the mechanism is being disrupted dramatically. The result is that investors see fewer companies, and companies see fewer of the right investors. A new approach is required to target and be introduced to the appropriate audience of decision-makers. For those readers who have worked tirelessly to convince senior management that further resources need to be devoted to investor relations and investor outreach, we hope the above supports your efforts. So what is the new approach? So what is the new approach? I'd be curious to learn what new communications and essentially IR branding strategies are being explored and actually tried?